Buckminster Fuller created the “Knowledge Doubling Curve”; he noticed that until 1900 human knowledge doubled approximately every century. By the end of World War II knowledge was doubling every 25 years. Today things are not as simple as different types of knowledge have different rates of growth. For example, nanotechnology knowledge is doubling every two years and clinical knowledge every 18 months. But on average human knowledge is doubling every 13 months. According to IBM, the build out of the “internet of things” will lead to the doubling of knowledge every 12 hours. In a recent lecture at Harvard University neuroscientist Jeff Lichtman, who is attempting to map the human brain, has calculated that several billion petabytes of data storage would be needed to index the entire human brain. The Internet is currently estimated to be 5 million terabytes (TB) of which Google has indexed roughly 200 TB or just .004% of its total size. 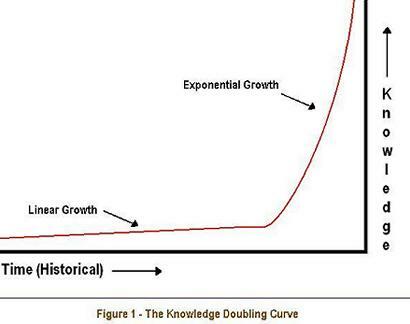 A transition from the linear growth of human knowledge to the exponential growth of human knowledge has taken place. According to researchers dealing with this information will necessitate the development of vastly more complex software, shareability, and artificial intelligence. Author Clem Chambers, in a Forbes article on Amazon’s “Mechanical Turk” believes leading edge computer technology will be combined with artificial intelligence allowing collective problem-solving on a larger scale and the creation of vast amounts of data.